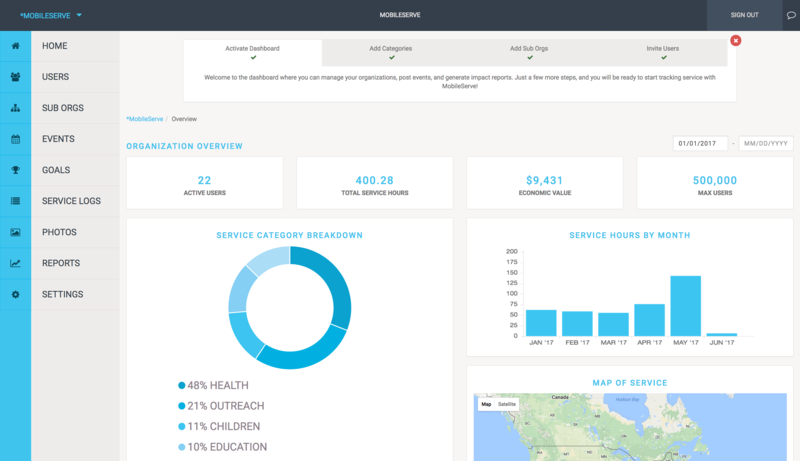 Check out these step-by-step instructions on each section of the MobileServe Dashboard. We also have video tutorials here. 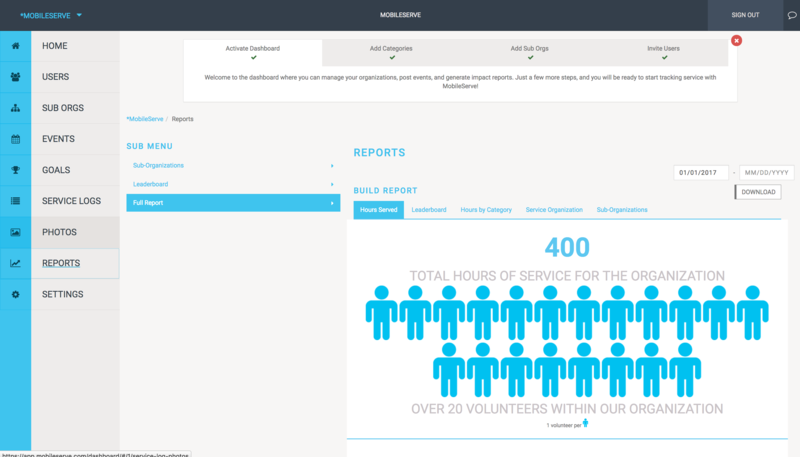 The Organization Overview is your Dashboard home and provides a quick glance at your organization. If you have any sub-organizations, they’ll be listed at the bottom of this page. Filter the data by date in the top right corner. 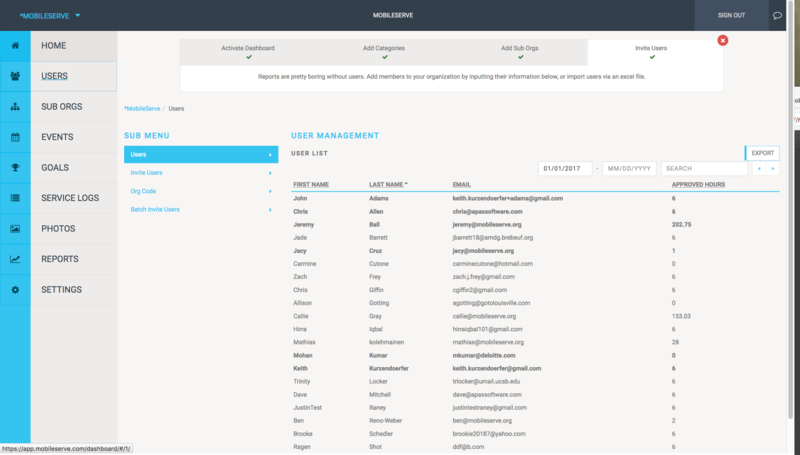 In the Users section, you can invite and manage users. 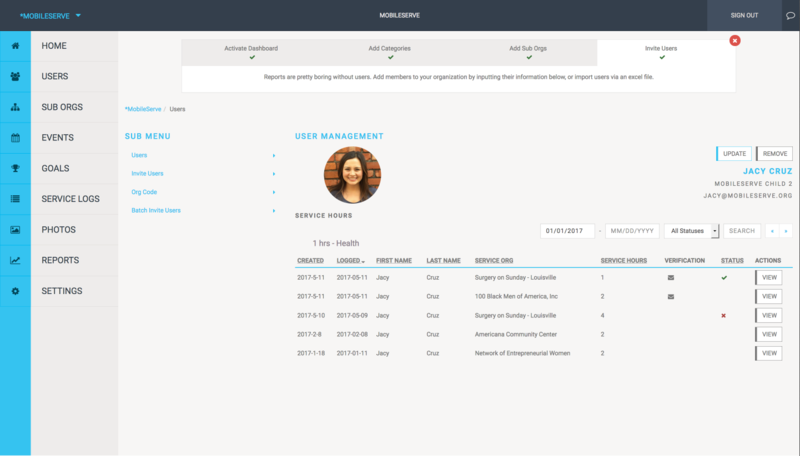 The User Management page shows basic contact information as well as total service hours each user has contributed to date. You have 3 options to invite users: enter addresses, upload a list, or email them directly. This option is best if you don’t have a lot of email addresses or for one-off invites. In Users, go to Invite Users. Enter the user’s contact information. If entering multiple email addresses, separate with a comma. Check the Admin box if the new user(s) should be an administrator of the organization. Select Send Invites. When the user creates an account through the link in the email, he or she will automatically be linked to your organization. This option is best if you’re inviting several new users. Email us a spreadsheet with the email address of each user, the sub-org name they belong to if applicable. The users will receive an email invitation directly from MobileServe. When they create an account through the link in the email, they will automatically be linked to your organization. You can bypass the in-app invitations, and simply provide your org code to your users. This option is best if you want to personalize the email or if you think people may delete (or not read) an email that comes directly from MobileServe. 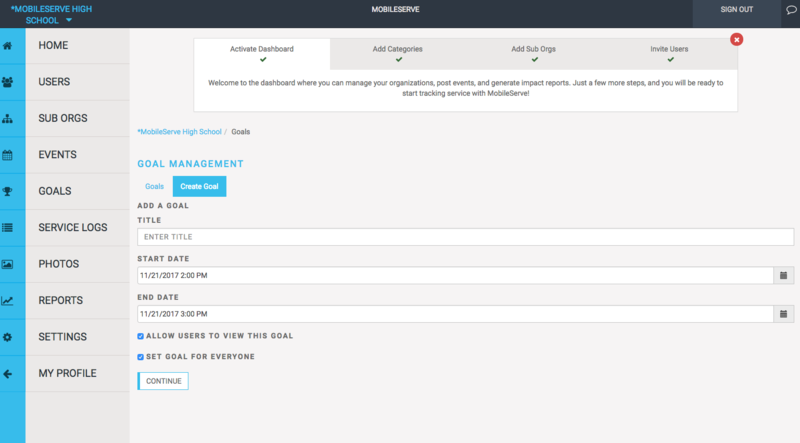 They can create MobileServe accounts and add the code during signup or at any point in their Settings. On the Users page, select “View” next to a name to go to their profile page, which lists all service logs. On the profile page, select “View” again to see details of the specific log. You can also export a list of all Users and their hours, including a breakdown of pending, approved, and total hours by service category. Click "Export" and select a file type. 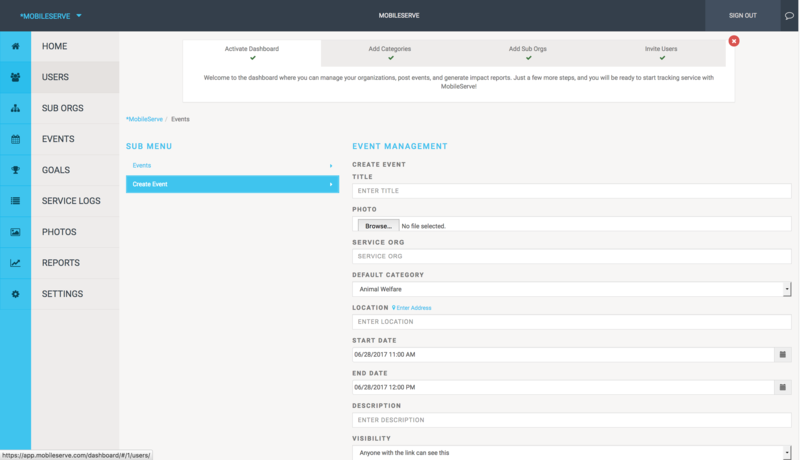 In the Sub Orgs section of your Dashboard, you can create and view sub-organizations. The default page shows a list of your existing sub orgs and their total hours. Clicking “Go To” next to a name will take you to that sub org’s Dashboard. From the Sub Orgs page, select “Create Sub Org” and enter the name. Once created, the name will appear on the main Sub Org page. 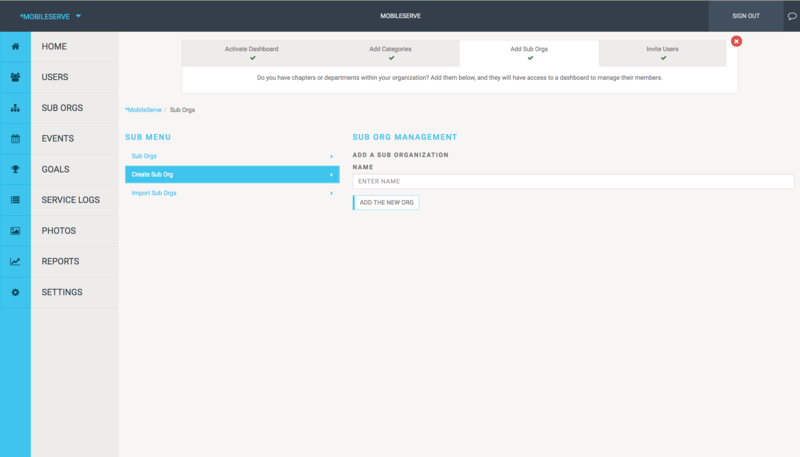 You can manage the sub org (e.g. invite users, view the sub org’s code, etc.) by going to its Dashboard. Photo - this is optional. If you add a photo, it will be included in the email invitation. Service Organization - this is also optional. Default Service Category, which is how you attendees’ logs will be categorized. After naming it, enter start and end times. Note, these are the times for the timeslot itself, not the overall event. Next, enter the number of volunteers you’d like for that slot and then click the checkmark to save. Use the same process to create as many timeslots as you need. You can invite everyone within your organization. Note: If you’re creating the event within a sub-org, selecting “invite everyone” will only include members of that sub-org. Or you can invite a specific sub-org or user by typing the suborg/user’s name in the search box. When the correct name appears, select it from the drop down. Click “Invite” to trigger the email invitations. You can edit or delete timeslot details at any time using the pencil or “x” icon. When users sign up for timeslots, you’ll see the total number under the “Signups” column. You can click the number to see who has signed up for that specific slot. 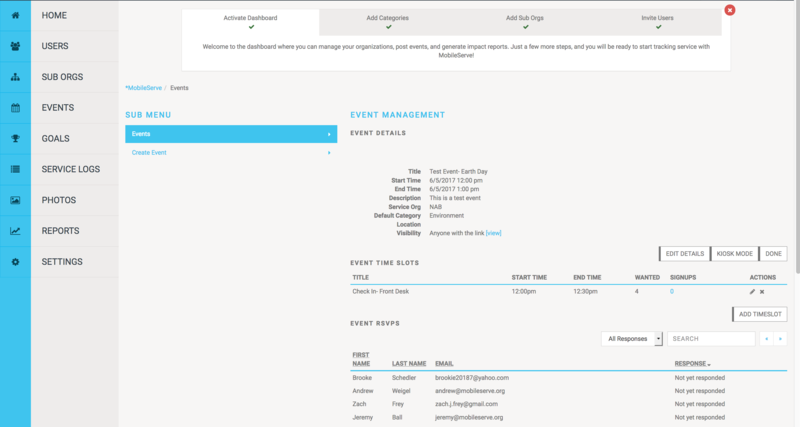 Under Event RSVPs you’ll see a list of the people you’ve invited to your event, and whether they’ve responded as going or not going. Click on the event you’d like to change. And click the “Edit Details” button in the top right. Be sure to click “Save” before going back to the main menu. Enter the details of your Goal, including the title, Start Date, and End Date. You have the option to make the goal invisible or visible to your members.. If you want your members to see the Goal and their progress in their user profiles, check the box next to ALLOW USERS TO VIEW THIS GOAL. Next, you’ll determine which members to apply the goal to. You can set the goal for everyone, by checking the box next to that option. Or, you can enter a specific user or sub-org name. Click CONTINUE after making your selection. Next, you have the option to tie the goal to a specific service category. Or, you can choose Total Hours, if the goal isn’t category-specific. Enter your goal total and click the “plus sign” to the right of that field to Save. If you want to create a goal for most people in your organization, but you have an exception for a specific user or sub-org, you can use the Override function. Click Override then Create New Override. Click “Save” to save this goal,this will return you to the “goal management” page, where you can view all the goals you have created within your organization. To see an overview of a specific goal, click “Goal Overview” and you will see a leaderboard list of users for whom that goal is set, as well as their progress on said goal. The Service Logs section shows every log that has been submitted, whether it was verified and how it was verified, and whether you have approved or rejected it. Filter by date to limit the results to a certain timeframe. 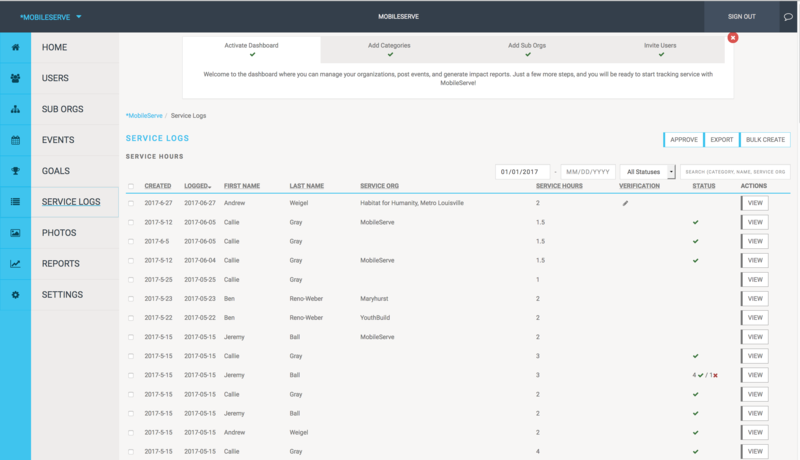 Search for a user, category, or service organization to isolate specific logs. Sort by Status to easily see which logs you've approved, rejected, or are awaiting your approval. Click “View” next to an individual log. Check the box next to the category you’re reviewing. Select the “Actions” button.Select “Approve” or “Reject” in the dropdown. If you Approve the log, a check mark will appear in the log. If you Reject the log, a box will appear, giving you the option to explain why you’re rejecting the log (you are not required to comment).The user will receive an email with a link to the log and the explanation. The user can edit their log and resubmit it for approval again. Click the “Bulk Create” button in the top right. Next, you’ll choose who you want to include in the Bulk Create action. If it’s everyone in your organization, click the “Create for Everyone” box and then click Bulk Create. You’ll receive a message asking you to confirm. Click Yes to continue or Cancel to go back. If you don’t want to create the log for everyone, leave the box unchecked. Instead, go to the Search bar and type the name of the user. The system will return matches based on name and email address. When you see the results, click on the correct user. Repeat this process for each user that should be included. You can remove a user by hovering over the box with their name, and clicking the X in the top right corner. You can also search for sub-orgs. Type the name of the sub-org, and select the correct ones. After you’ve selected the users, click the Bulk Create button. 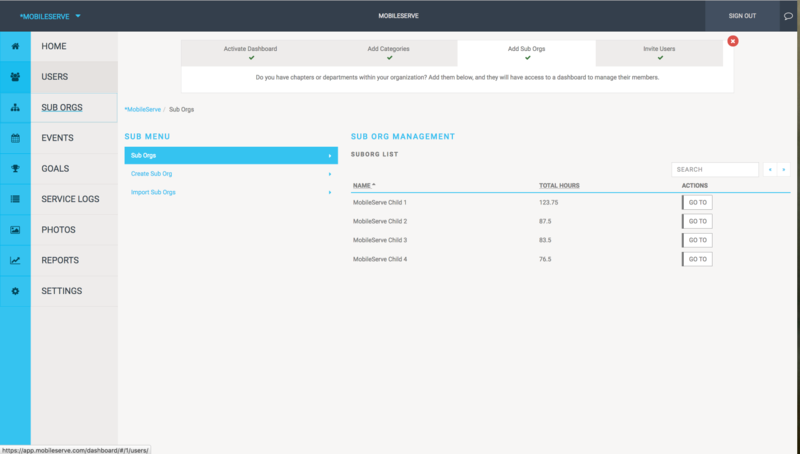 All service logs created through the Bulk Create feature, will automatically receive Admin Approval, since only an admin can create them. To export only some logs, check the box next to those logs and select the “Export” button in the top right. To export all logs, select the “Export” button in the top right and confirm you want to export all logs. 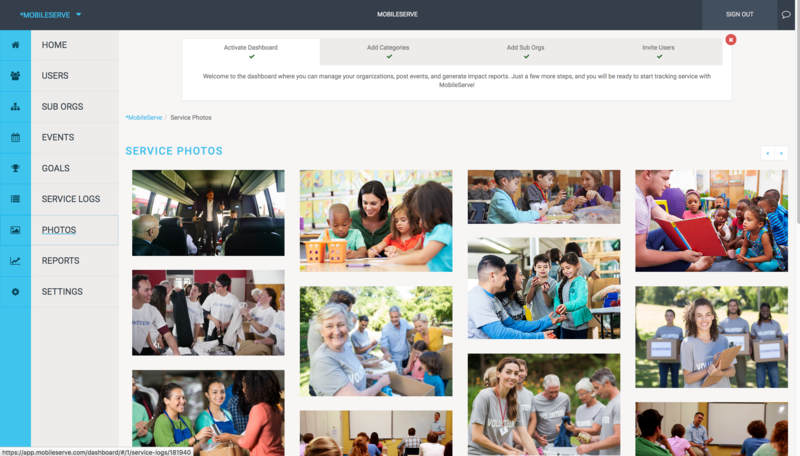 Users can include photos when logging their volunteer time, and they have the option to push them to their social media channels. All photos taken by your members will appear in your Dashboard in the Photos section, regardless of whether the member posted it elsewhere. Clicking on any photo will take you to the service log it is attached to, so you can easily read the story behind the image. The Reports section of your Dashboard lets you download individual infographics or combine them for a custom report. You can download data as an Infographics (.png file) or as a csv. Under Full Report, click on one of the options. Click “Download" and select the file type. Click on the option header again to remove it. Under Full Report, click all the data points you want to include. The report is built in real-time, so you can see what it looks like to add or remove the data points. Your Settings page shows your Organization name and Service Categories. To add a category, type the name into the blank box and hit the “+” incon. To change the visibility of an existing service category, check or uncheck the “Visible” box. Note: If a category is invisible, users cannot use it in future logs. Any past logs assigned to that category will continue to show up in that category in your reports. To delete a category, select the trash icon next to the name.If there are hours in that category, you will receive a message asking you to reassign them to a different category. Note: If you deleted a category, it will not show up in any reports.